pimatic-radiohead is a pimatic plugin that integrates RadioHead into pimatic. With pimatic-radiohead you are able to include pimatic into your RadioHead network using a serial interface. You may also use a small microprocessor (e.g. an Arduino nano) as a serial-radio-gateway to include some radio hardware. Build you own bus system based on pimatic, RS485 and radio devices! RadioHead is a open source Packet Radio library for embedded microprocessors. It provides addressed, reliable, retransmitted, acknowledged variable length messages. pimatic-radiohead uses the radiohead-serial Node.js module. Receive messages/commands from other nodes in you local RadioHead network. Send messages/commands to other nodes in you local RadioHead network. Devices to show and process messages received from other nodes. Devices to send messages to other nodes. 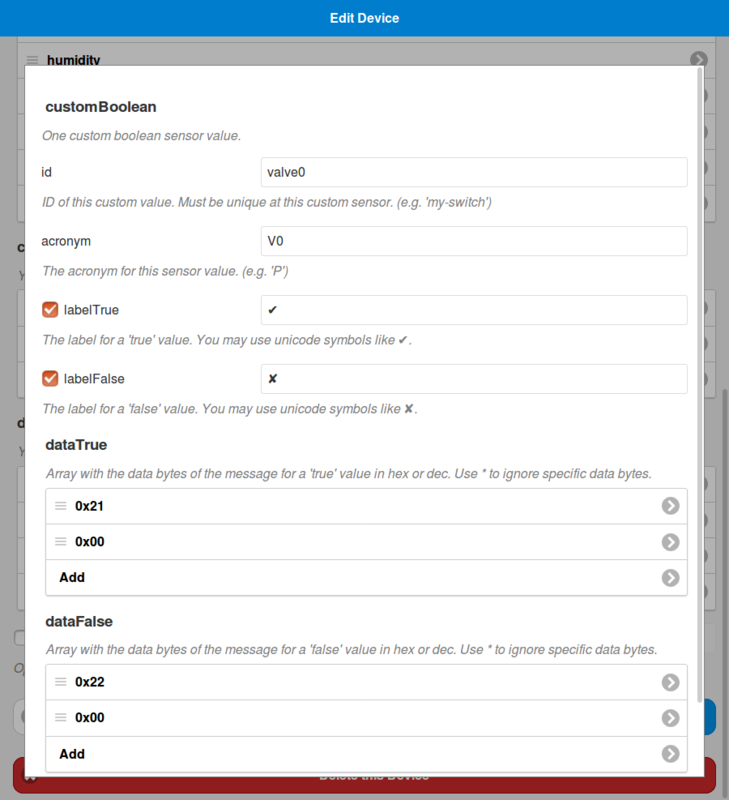 Rules are supported for triggering actions and sending messages including variables. 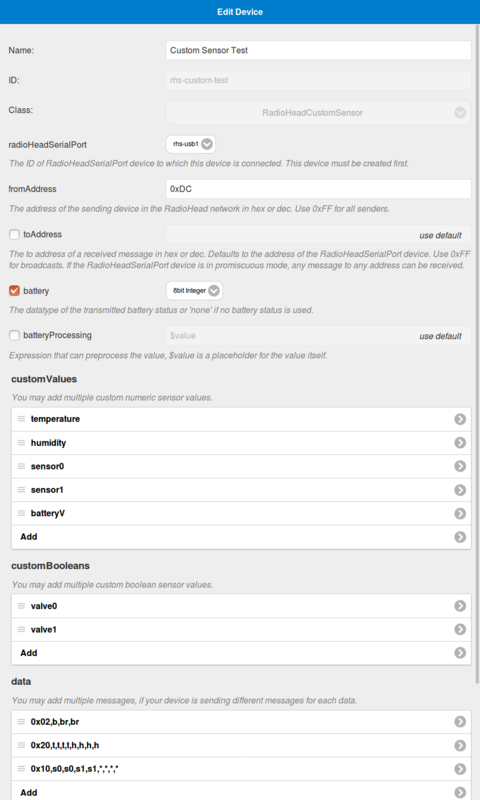 Device attributes give you some statistics about sent and received messages. Multiple RadioHead networks are supported using different serial interfaces. 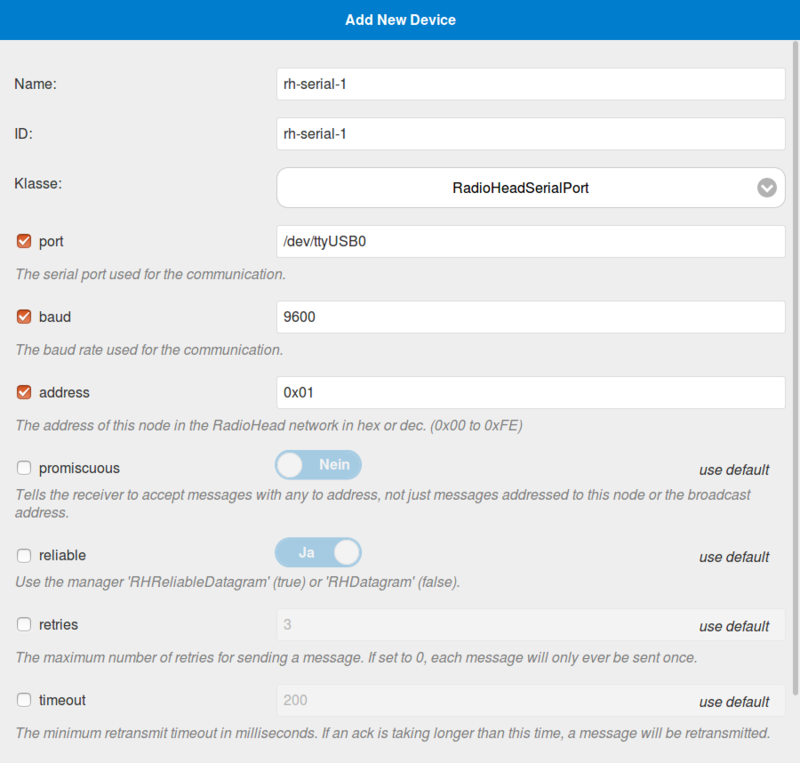 All device configuration can be done using the pimatic frontend. A detailed description of all config options is available in the file device-config-schema.coffee. This is a special device, which provides the interface to the serial hardware. It is needed for all other devices. By default only messages addressed to this node or the broadcast address are handled. You may activate the promiscuous mode to handle messages with any to address. A ContactSensor based on received messages. You need to define some data bytes, which have to match a received messages for the closed and opened action. An automatic reset is also possible, if the sending device only emits one action. A PresenceSensor based on received messages. You need to define some data bytes, which have to match a received messages for the present and absent action. An automatic reset is also possible, if the sending device only emits one action. A Switch which sends configurable messages if turned on or off. A ShutterController which sends configurable messages if moved up, moved down or stopped. An automatic stop is also possible, if you wish to stop after a specific time. A ButtonsDevice to provide some buttons. One button can send and/or receive messages. You may use this device to send a message if the user clicks a button in the frontend. You may also use this device to handle some buttons from a remote control. A Sensor which can receive and display various weather information. 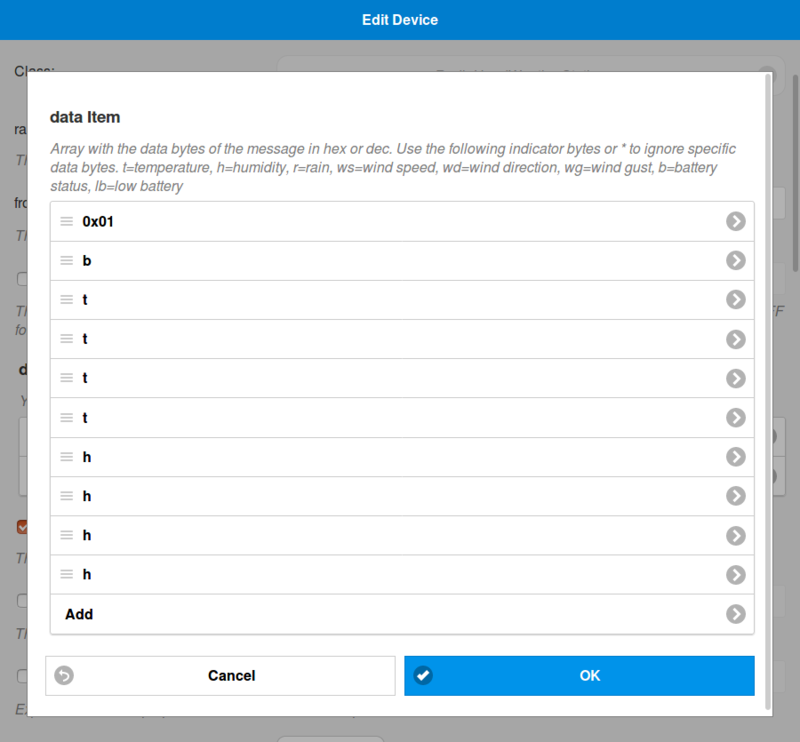 You are able to define multiple data messages to extract the values. Each value can be preprocessed by an expression to manipulate the received value. Values which consists of more than one byte can be in Little-Endian (LE) or Big-Endian (BE) format. A Sensor which can receive and display various numeric and boolean data. 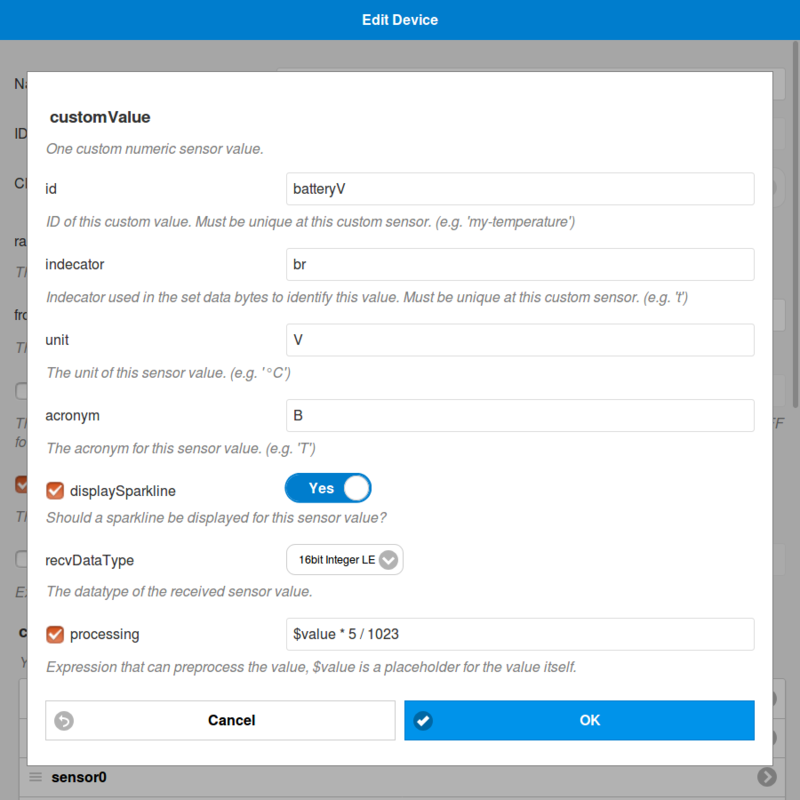 You can define multiple custom numeric and boolean sensor values and you are able to define multiple data messages to extract the values. Each numeric value can be preprocessed by an expression to manipulate the received value. received - Optional word for better readability. dataBytes - The received data bytes in hex notation, separated by spaces. You may use a * as wildcard to accept any byte at this position. senderAddress - The address of the sending node in the RadioHead network in hex notation. 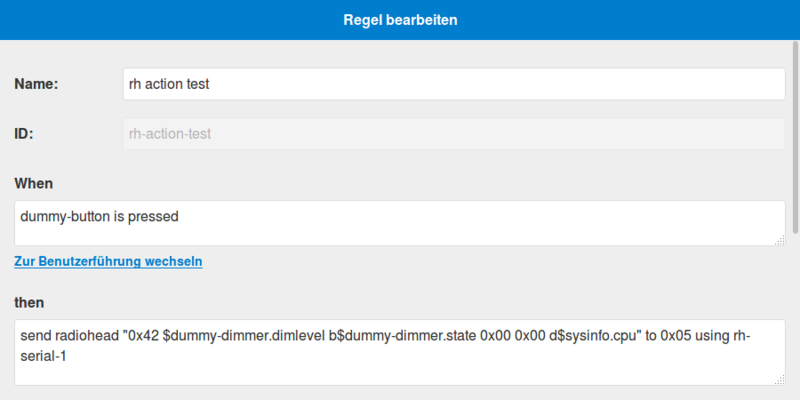 You may use 0xFF to accept all senders. recipientAddress - Optional. The address of the receiving node in the RadioHead network in hex notation. If omitted, the own address of the device will be used. Useful for broadcasts or if the RadioHeadSerialPort device is used in promiscuous mode. 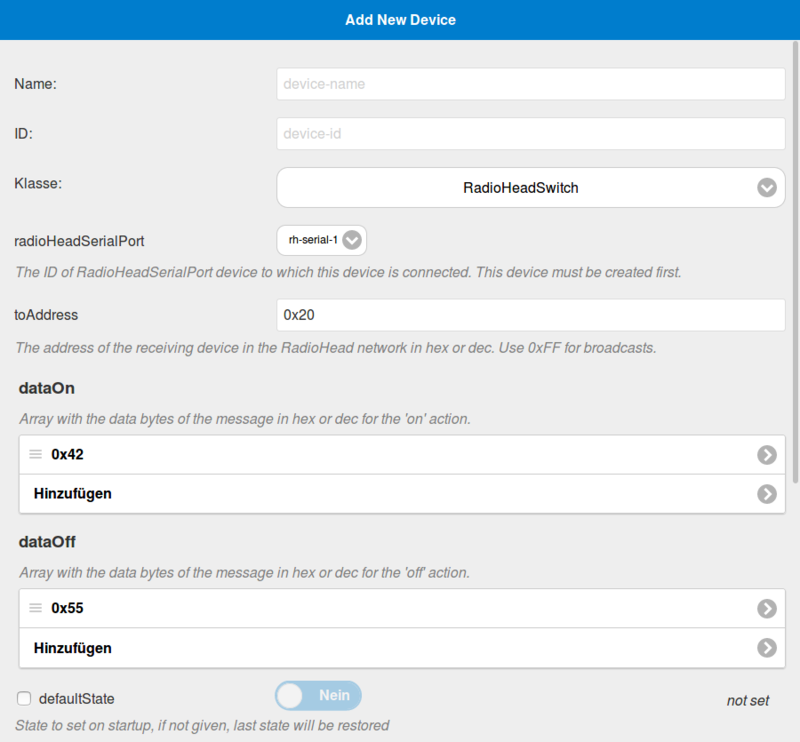 device - ID or name of the RadioHeadSerialPort device which is used. send - Optional word for better readability. dataBytes - The data bytes in hex notation to send, separated by spaces. You may also use variables as described below. recipientAddress - The address of the receiving node in the RadioHead network in hex notation. Use 0xFF for broadcast messages. You can include pimatic variables in the data bytes as well as static byte values. There are some modifiers to define the datatype of the transmitted variable content. A modifier is a single letter, which is prefixed to the variable name. Without any modifier a variable will be sent as one byte, representing the 8-bit unsigned integer value of that variable. All variables will be sent using little-endian format. "0x01 $my_var d$my_temperature" will sent 10 bytes: One byte with the fixed value 0x01, one byte representing the 8-bit value of $my_var and 8 bytes representing the temperature saved as double in $my_temperature. sentOkCount - The count of successfully sent messages since the last start. sentErrorCount - The count of faulty sent messages since the last start. receivedCount - The count of received messages since the last start. retransmissionsCount - The count of retransmitted messages since the last start. High values indecat problems (e.g. bus collisions or unreachable devices). You can enable the debug mode in the plugin config. In debug mode you will find all received RadioHead messages in the log and some other additional information, e.g. about matched data for the devices. 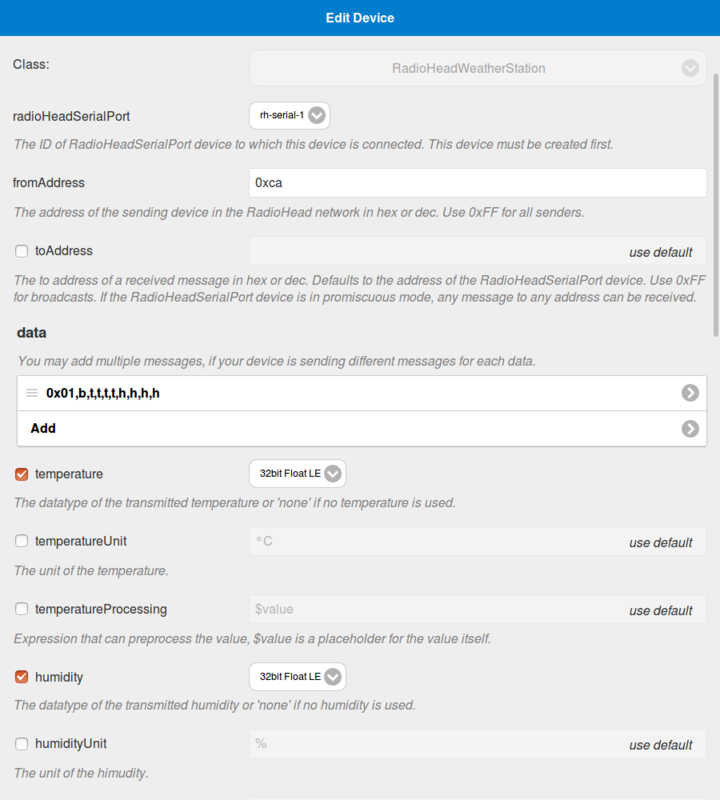 Some parts of the RadioHeadWeatherStation devices are inspired by pimatic-homeduino. string The serial port used for the communication. integer The baud rate used for the communication. boolean Tells the receiver to accept messages with any to address, not just messages addressed to this node or the broadcast address. boolean Use the manager 'RHReliableDatagram' (true) or 'RHDatagram' (false). number The maximum number of retries for sending a message. If set to 0, each message will only ever be sent once. number The minimum retransmit timeout in milliseconds. If an ack is taking longer than this time, a message will be retransmitted. string The ID of RadioHeadSerialPort device to which this device is connected. This device must be created first. 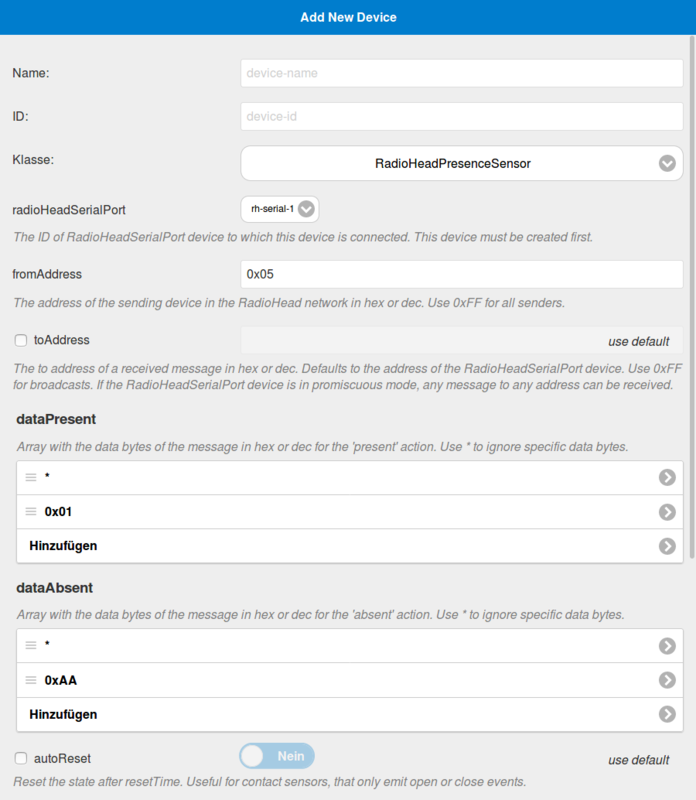 string The address of the sending device in the RadioHead network in hex or dec. Use 0xFF for all senders. 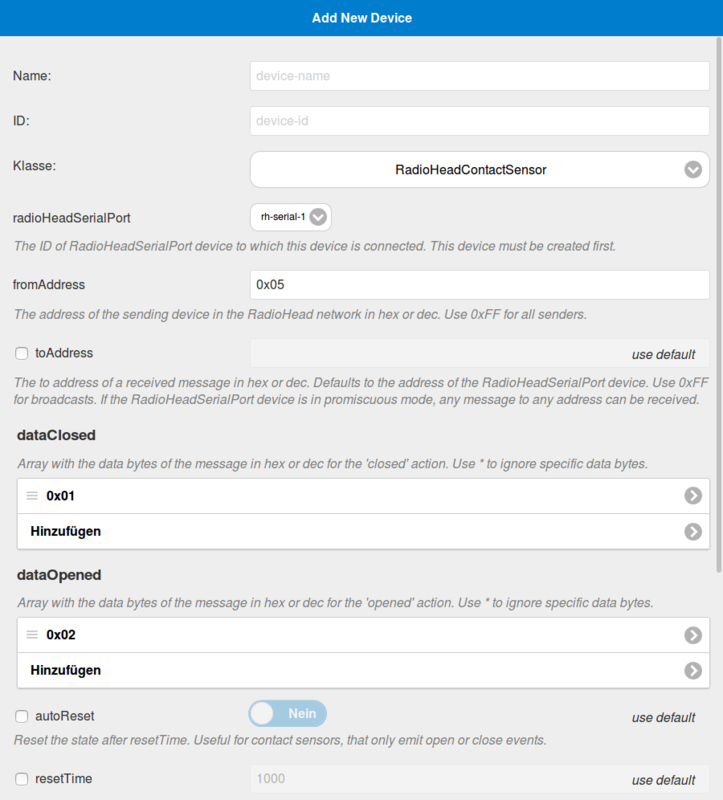 string The to address of a received message in hex or dec. Defaults to the address of the RadioHeadSerialPort device. Use 0xFF for broadcasts. 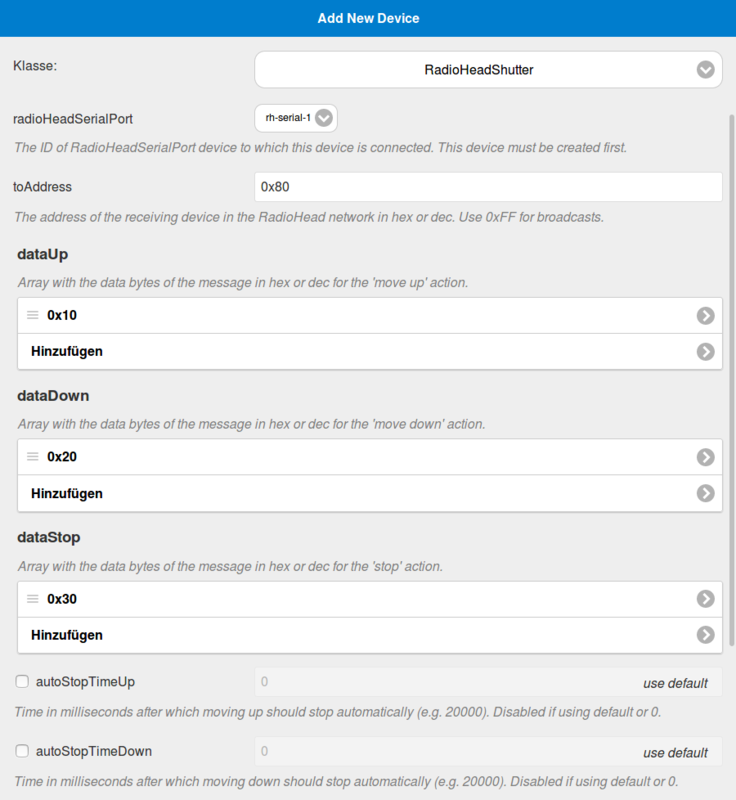 If the RadioHeadSerialPort device is in promiscuous mode, any message to any address can be received. array of strings Array with the data bytes of the message in hex or dec for the 'closed' action. Use * to ignore specific data bytes. array of strings Array with the data bytes of the message in hex or dec for the 'opened' action. Use * to ignore specific data bytes. boolean Reset the state after resetTime. Useful for contact sensors, that only emit open or close events. integer Time in ms after that the contact state is reseted. array of strings Array with the data bytes of the message in hex or dec for the 'present' action. Use * to ignore specific data bytes. array of strings Array with the data bytes of the message in hex or dec for the 'absent' action. Use * to ignore specific data bytes. string The address of the receiving device in the RadioHead network in hex or dec. Use 0xFF for broadcasts. array of strings Array with the data bytes of the message in hex or dec for the 'on' action. array of strings Array with the data bytes of the message in hex or dec for the 'off' action. array of strings Array with the data bytes of the message in hex or dec for the 'move up' action. array of strings Array with the data bytes of the message in hex or dec for the 'move down' action. array of strings Array with the data bytes of the message in hex or dec for the 'stop' action. integer Time in milliseconds after which moving up should stop automatically (e.g. 20000). Disabled if using default or 0.
integer Time in milliseconds after which moving down should stop automatically (e.g. 20000). Disabled if using default or 0.
array of objects The Buttons. string The ID of this button. This must be unique. string The text of this button. This will be shown in the frontend. boolean Enable sending with this button. You must also set 'toAddress' and 'dataSend'. array of strings Array with the data bytes of the message in hex or dec for sending. boolean Enable receiving with this button. You must also set 'fromAddress' and 'dataReceive'. string The from address of a received message in hex or dec. Use 0xFF for all senders. array of strings Array with the data bytes of the message in hex or dec for receiving. Use * to ignore specific data bytes. array of arrays You may add multiple messages, if your device is sending different messages for each data. The datatype of the transmitted temperature or 'none' if no temperature is used. string The unit of the temperature. string Expression that can preprocess the value, $value is a placeholder for the value itself. The datatype of the transmitted humidity or 'none' if no humidity is used. string The unit of the himudity. The datatype of the transmitted rain fall or 'none' if no rain fall is used. string The unit of the rain fall. The datatype of the transmitted wind speed or 'none' if no wind speed is used. string The unit of the wind speed. The datatype of the transmitted wind gust or 'none' if no wind gust is used. string The unit of the wind gust. The datatype of the transmitted wind direction or 'none' if no wind direction is used. The datatype of the transmitted battery status or 'none' if no battery status is used. The datatype of the transmitted low battery status or 'none' if no low battery status is used. array of objects You may add multiple custom numeric sensor values. boolean Should a sparkline be displayed for this sensor value? The datatype of the received sensor value. array of objects You may add multiple custom boolean sensor values. string The label for a 'true' value. You may use unicode symbols like ✔. string The label for a 'false' value. You may use unicode symbols like ✘. array of strings Array with the data bytes of the message for a 'true' value in hex or dec. Use * to ignore specific data bytes. array of strings Array with the data bytes of the message for a 'false' value in hex or dec. Use * to ignore specific data bytes.